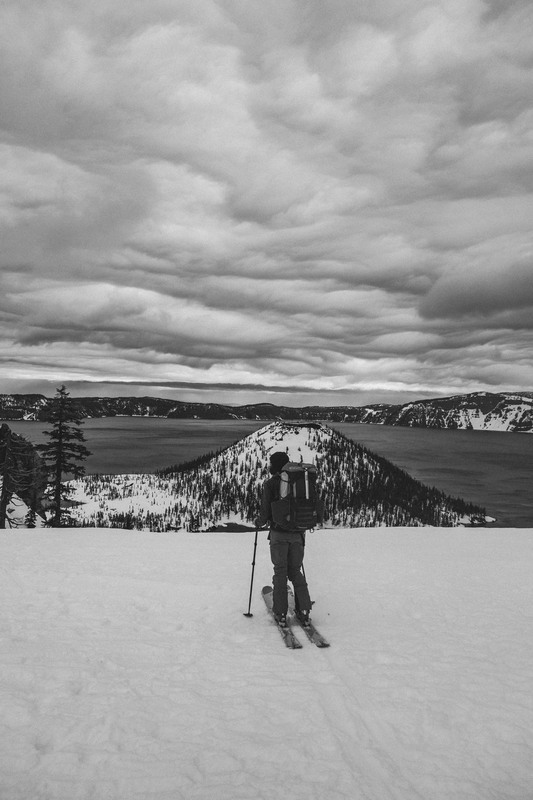 Thinking of words to describe the experience of circumnavigating Crater Lake by alpine touring skis in two days is difficult. Perhaps there hasn’t been enough time since having the experience to fully process it. Perhaps there just aren’t words to describe the ups and downs – both figurative and literal – of such a venture. Let’s just start from the beginning. Phase one is the plan. Some glorified concoction of an adventure that is equal parts challenging and rewarding. Backcountry skiing 33+ miles in two and a half days? Sounds perfect. For days, free time is spent staring at beautiful images of the deepest lake in North America. Fantasizing seeing it from every possible angle. Trip reports, snow conditions, ideal dates, all of it becomes an obsession. Praying for perfection but planning for the opposite. Next step is wrangling in other crazy people to share the endeavor with. The immediate response is a group of four other ski fanatics who are all game to get after it. The grand idea of circumnavigating Oregon’s only National Park is enticing, and many are quick to jump aboard. As the departure date looms closer and conditions drop to a little less than ideal, only one stuck to the game plan. Emily Mannisto and I were to partner up and tackle this endeavor as two outdoor females (who might be slightly masochistic). 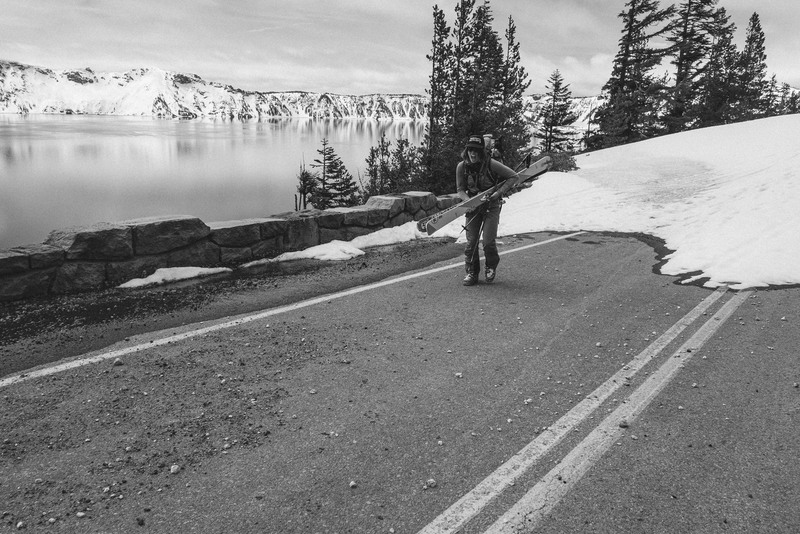 Research warned that the 33-mile Rim Drive route for circumnavigating was no cakewalk. 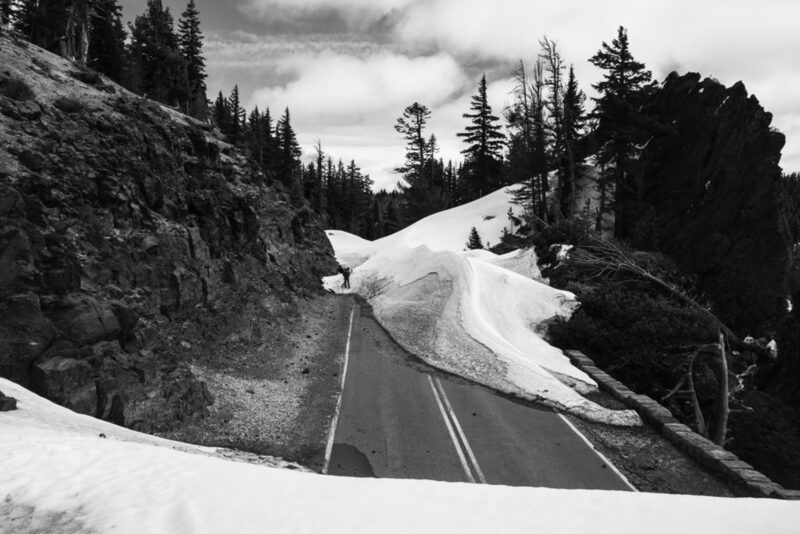 Windswept roads, difficult to navigate terrain, varying elevation gains and losses, multiple avalanche zones, no cell service and no option for bailout. 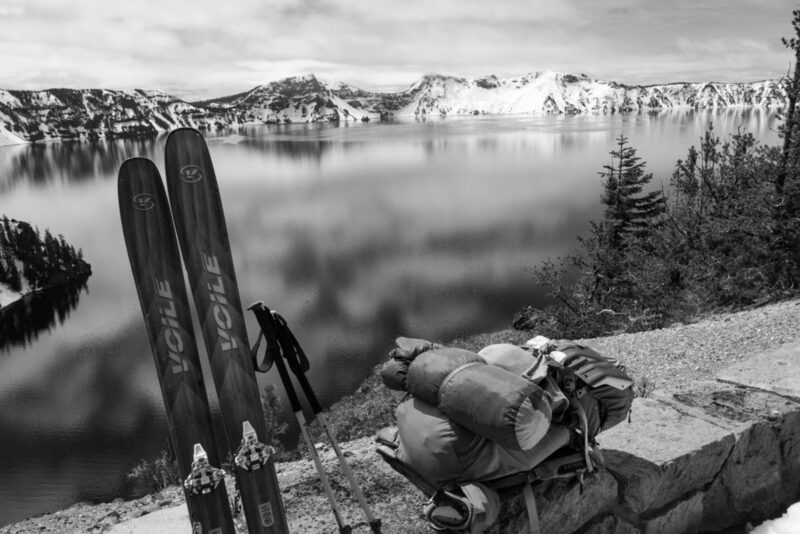 Backcountry ski books recommended the trip be completed in 2-3 days and was classified as an “Advance” tour. However, the speed record for finishing the circumnavigation was eight hours. Feeling young and invincible, Emily and I decided that we were strong enough to endure whatever Crater Lake had to offer. We started late in the afternoon on day one. Since the roads were beginning to be plowed the overnight parking was located at the Ranger Station instead of the Rim Village. As a result, this added an extra mile and a half to the tour plus roughly 1,000ft elevation gain. Once at the “official” start point, the trail followed along an uneven snow wall since the plows were working and had made about a mile progress. The wall made for difficult terrain and uneven snow. We were stoked when we were finally done with that section. Shortly into the tour we reached the Watchmen area which is one of the many avalanche zones with no real bypass option. 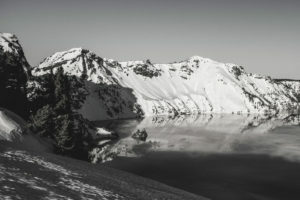 Being early May – late in the season – the snow was wet and loose making wet slabs the biggest avalanche danger. 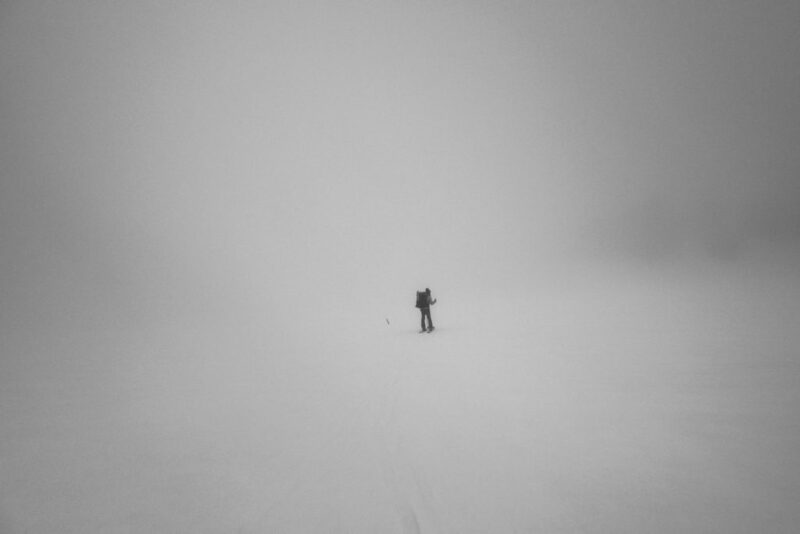 Fortunately, we spread ourselves far apart and within an hour were across the avy terrain. As we continued on, the looming storm clouds slowly began dipping lower and lower. Only about seven miles in, we determined the storm was upon us and it was time to hunker down for the night. Within fifteen minutes of having built the snow platform and setting up camp, the rain and wind were upon us. The next morning was a complete whiteout. Without words, we broke down camp and started navigating our way along the rim. For several hours we were engulfed in white clouds with almost zero visibility. Later, once the clouds had lifted and we were baking the sun, Emily and I confessed that had either of us suggested turning around in the morning we were open to the idea. However, neither of us would let ourselves utter the suggestion and therefore it was never mentioned and we trudged on. Now, we were past the point of no return. The only way to get back was to finish what we started. 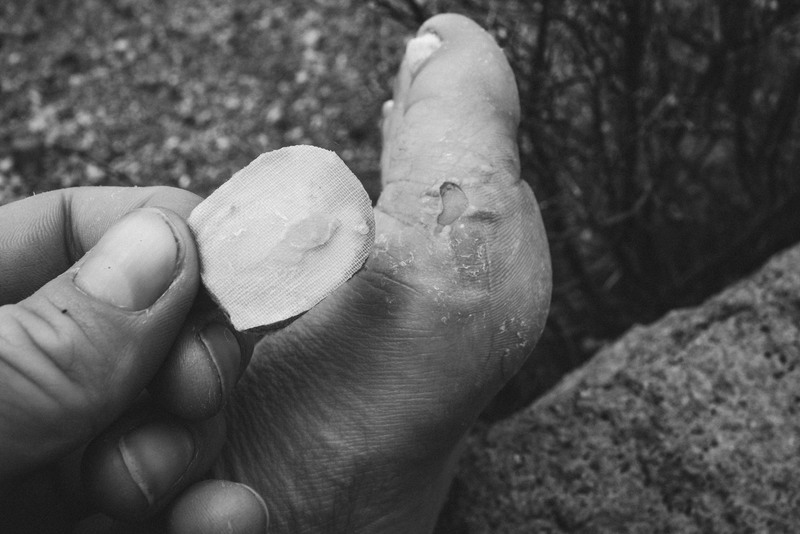 Halfway through the second day, our blisters had blisters. The pain got to the point where my feet were numb blobs, until a terrain change would send a shock of wincing pain. At nearly 16 miles for the day, we tapped out and set-up camp just shy of Kerr Notch. After a few shots of whiskey and comparing battle wounds, sleep came swiftly. Starting the circumnavigation clockwise is the most common approach, yet leaves the greatest amount of elevation change for the final day. Waking up with festering blisters and sore muscles was no excuse; we had to finish this endeavor. We buckled in and began the final day at 6am. Weather was gorgeous and the temperature reached 60-degrees, which ultimately made the snow even wetter. On this final stretch is when the trail passes through several avalanche zones. We opted to take the avy bypass route, which added roughly 3-4 miles. As we traversed below the avy zone, we witnessed two miniature avalanches and a rockfall. Ultimately, we made the right decision adding on the extra mileage. The bypass traversed through thick forest, and the sensation of true backcountry exploration kicks in. Traversing hillsides and gliding through tree pockets while avoiding exposed wells made for a few glorious (miniature) turns. But the shelter from the blazing sun was short lived, and soon the heat of the day was beating down on us. 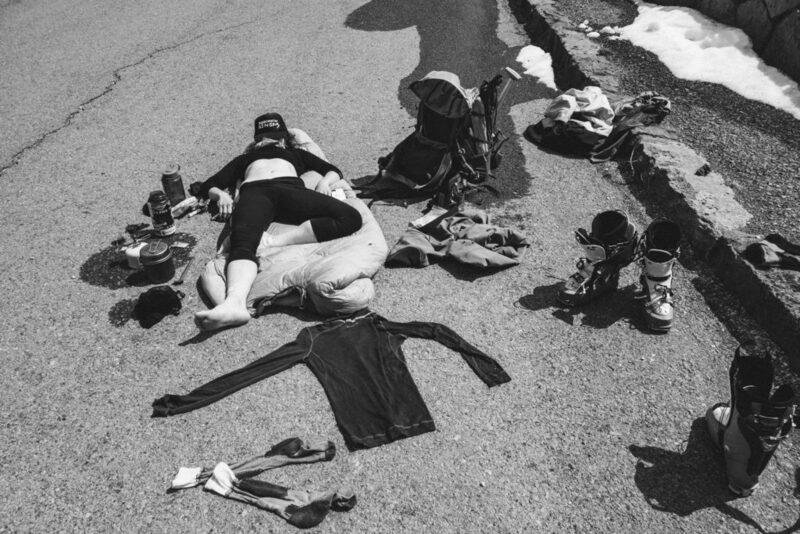 As the bypass met back up with the Rim Drive, Emily and I were stripped down to bare minimum clothing, and practically chugging water. At one point I was just shoveling snow in my mouth and rubbing it on the back of my neck to stay cool. While touring and reflecting on how I would write about this experience, I had one goal: honesty. Although the scenery was beautiful and the company sublime, it was not an easy endeavor. It was the definition of a sufferfest. Yet, it was exactly the challenge I’ve been craving. 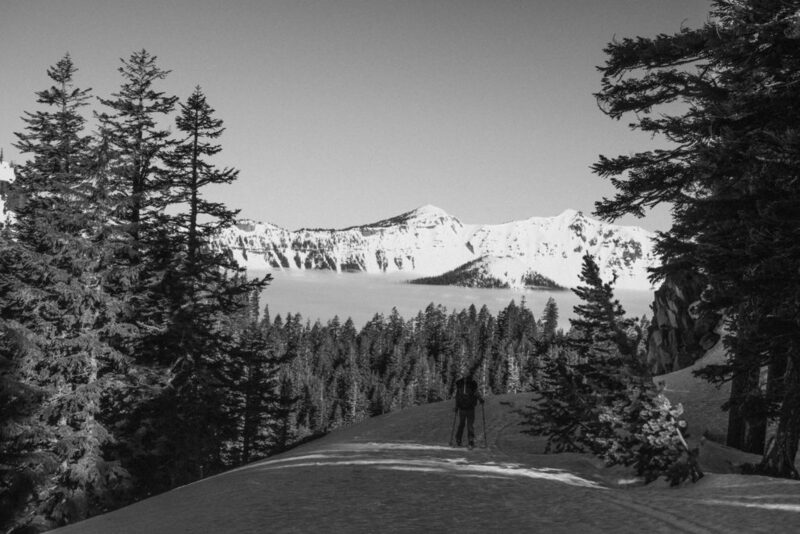 Brooke Jackson is a writer and photographer based in Seattle, WA, and founder of Wandering Trails Media. 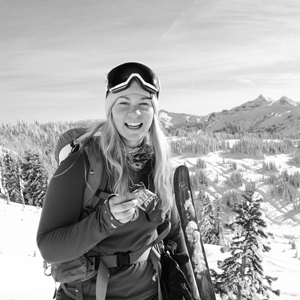 Her background specializes in climbing, kayaking, and, of course, skiing! 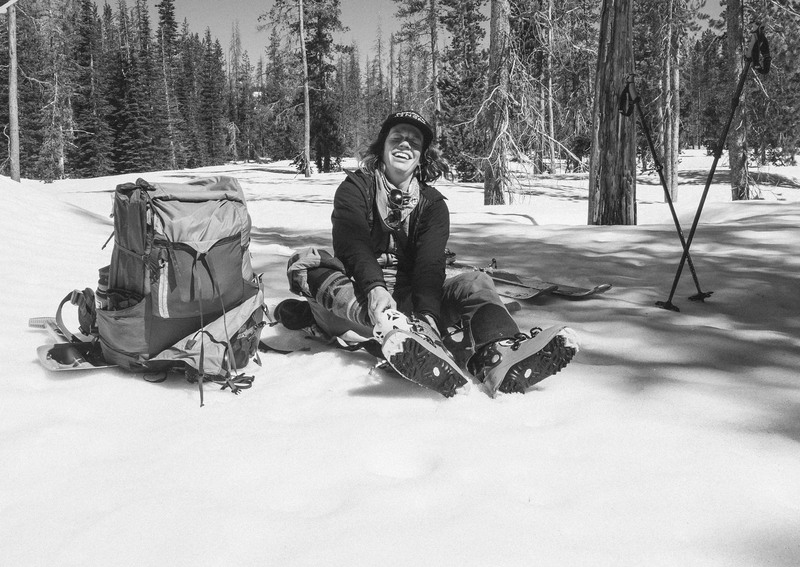 As an instructor for REI, Brooke finds joy in educating others on how best to get outside and get after it in a responsible and sustainable way.